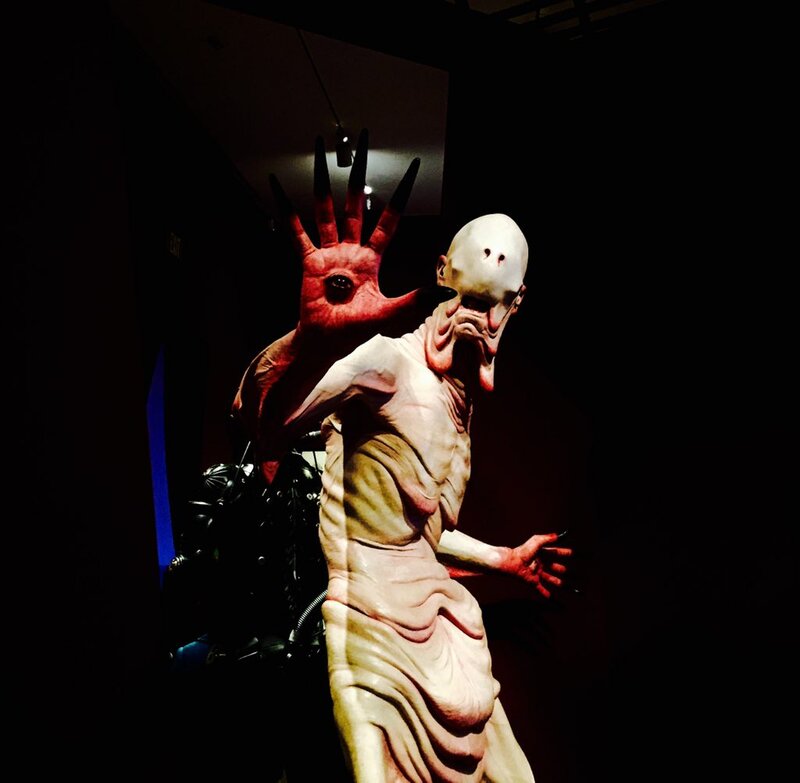 Slowly and in awe, I pilger with many others through the LACMA (Los Angeles County Museum of Art) exhibition that gives us a glimpse into the mind of Guillermo del Toro and his passion for the past and the mystery that holds for us. His admiration for Poe and Lovecraft is evident. The quirky side of his collection of horror comics, dolls and wax figures of his idols makes him relatable to all of us who live for the thrill of the anticipation of the scare, an unsolved mystery, a love-story, a glimpse into the past. I imagine him hunting down treasures, and with each find, a loving touch of the special piece, the muse kisses him and the story unfolds. While I linger way too long (at the risk of p*ssing off all the other visitors) on his journals, which are pieces of art themselves, I wonder when did his fascination with the unknown start? When did his imagination go into overdrive? Did he lie awake at night, as a child, and make friends with the shadows of the night? What many may see as a morbid obsession with death, he sees a life once lived, the sorrow of loss and the hope that comes with it in time. His ghosts and monsters are not there for shock value, but they tell their story of love, hatred and the secrets they only reveal to the chosen one and so long as they are remembered, so long the story stays alive. I stop at the corner where a wax figure of Santi, the boy who died in The Devil’s Backbone stares out of the shadow. The Devil’s Backbone, set in the Spanish civil war, similarly to Guillermo del Toro’s other work, Pan’s Labyrinth, shows the horror of war, of loss and particularly children dealing with the terrible consequences of it all. Young Carlos (The Devil’s Backbone) and Ofelia (Pan’s Labyrinth) don’t always understand the feelings they experience. Perhaps the ghosts and monsters are the way their minds are able to process what has happened, they are the buffer to keep them separated from the real evil. What makes Guillermo del Toro movies so special for me is the magical realism. He uses fairytale elements to fight utter darkness. His choice of setting makes the gothic stories send shivers down our spines. His movies are guided by symbolism, and this is obvious in his choice of artefacts. I stop at the framed insects, poked by needles, preserved for eternity, thinking how much he must love those creatures to give them back life by including them in the story. Like “Cronos” and the golden beetle, “Mimic” that shows mutating cockroaches that adapt way too well to human behavior, Crimson Peak and its moths. I’m coming to the end of the LACMA exhibition. Leaving the Pale man, Pan, Hellboy, Abe, Lady Lucille, Edith and all the tortured ghosts behind, feeling inspired – maybe kissed by the muse like Guillermo when he finds his treasures. Excellent review. Great vivid photos. I'm definitely going to check this exhibition. I love his movies. Well written. Thank you. Wow! This looks incredible! Magic realism is by far the best way to describe del Toro! He's such a talent! !